The Fender Deluxe Roadhouse Stratocaster is a model built for the stage, with the classic look of a Strat and a range of features that make this guitar incredibly versatile. This is a superior model that would suit any live musician thanks to its ability to create a vast array of tones, enhancing your sound whether you're a lead or rhythm guitarist. The Deluxe Roadhouse Strat takes all the classic features of a Strat and brings it up a notch. With the discernible double cutaway body, the slick curves of the body offer ultimate playing comfort. Built using alder, as with many other Stratocaster guitars, it retains that balanced timbre that enables you to experiment with a wide range of musical genres. 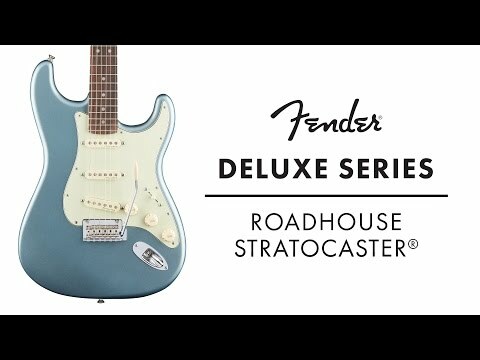 The Deluxe Roadhouse Strat has a lightweight feel which improves playability and reduces fatigue. A sleek maple neck with a contoured neck heel and 4-bolt asymmetrical neck plate is fitted to the Deluxe Roadhouse Strat. These prominent features of the neck, combined with the classic double cutaway body ensure total freedom over the neck, allowing you to play with ease. A pau ferro fingerboard with a 12-inch radius tops the neck, providing a fast playing feel and facilitating string bends. The Deluxe Roadhouse Strat is kitted out with three single-coil Vintage Noiseless pickups, giving you the quintessential Strat sound with complete clarity and coherence. Powered by Alnico II magnets, these three pickups create intricate harmonics with no hum thanks to the expert craftsmanship that goes into the making of each pickup. A six-position V6 switch is fitted to the guitar for you to control your tone, while it also gives you six additional tone variants to play with. It also has an S-1 switch in the Master Volume control pot to give you only the purest pickup sounds as it bypasses the preamp. The body bears a 2-point deluxe synchronized tremolo with a pop-in arm, ensuring a smooth, reliable connection is maintained between the body and the strings. This not only improves sustain and intonation, but it allows you to create superb vibrato tones, too. The traditional, visual aesthetics are retained in the Deluxe Roadhouse Strat, with nickel / chrome hardware and a 3-ply mint green pickguard and aged white pickup covers, control pots and switch tip. The Fender Deluxe Roadhouse Strat is certainly a deluxe model by both name and nature, making it an absolute joy to play.